If you use Storman's built-in stock control system to manage the items you have in your inventory (e.g. : boxes, locks, bubble wrap, etc) and warn you when you run low on a particular item, you will need to add items to the inventory before you can begin selling them - as Storman will assume you are beginning with "zero" quantities of each item when you first start off using the stock control system. 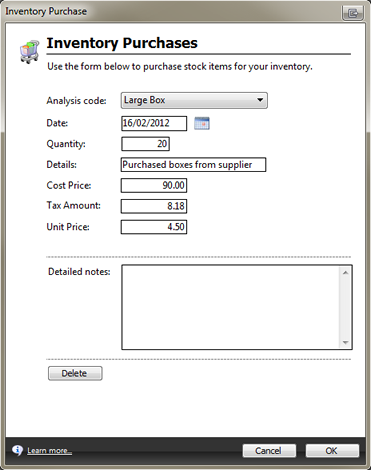 During the below process you will be adding inventory quantities into Storman. Important: This article assumes you have added Analysis code for each item and have opted to have Storman track its stock levels, as seen below. From the Accounting menu, select Inventory Item Purchases, Adjustments and Transfers. Click the 'Add New Purchase' button to add a new stock transaction to the system and the following screen will appear. Analysis Code: This is the stock item description. Quantity: This is the amount of stock you wish to purchase. Prices: The Unit Price is taken from the Standard cost price under Analysis Codes and the Cost Price is the result of the Quantity entered for the purchase multiplied by the Unit Price. Select OK to save and close the new inventory purchase.